I’ve got nothing for these guys – can you imagine what an Internet search turns up for “Quit Thinking”? A lot of self-help psychiatric nonsense, that’s what. “How to Quiet Your Mind and Quit Thinking So Much.” “Stop Thinking So Much.” “5 Motivation-Killing Thoughts You Must Stop Believing.” For a Scientologist like me, this all sounds pretty terrible, since, you know, we hate psychiatry (quacks!). (Just kidding, I’m not a Scientologist. But Beck is.) Good thing it has nothing to do with the music on this tape. Maybe it’s good that there’s nothing out there on these cats. Here are the personnel: Blondie – drums; K – guitar; Jim – guitar. “Rec at Dumpbucket Pub.” Released as “logcabinrecordings009.” Nothing on them either. Again, all for the best. The guitars are overdriven, over-effected, and warbly, and the drums are nonexistent on side A, and barely coherent on side B. The recording? Perhaps someone brought a boombox to the pub and hit record while the band did whatever it’s doing. Each side is a “jam,” on a couple of chords. Are you friends with this band? 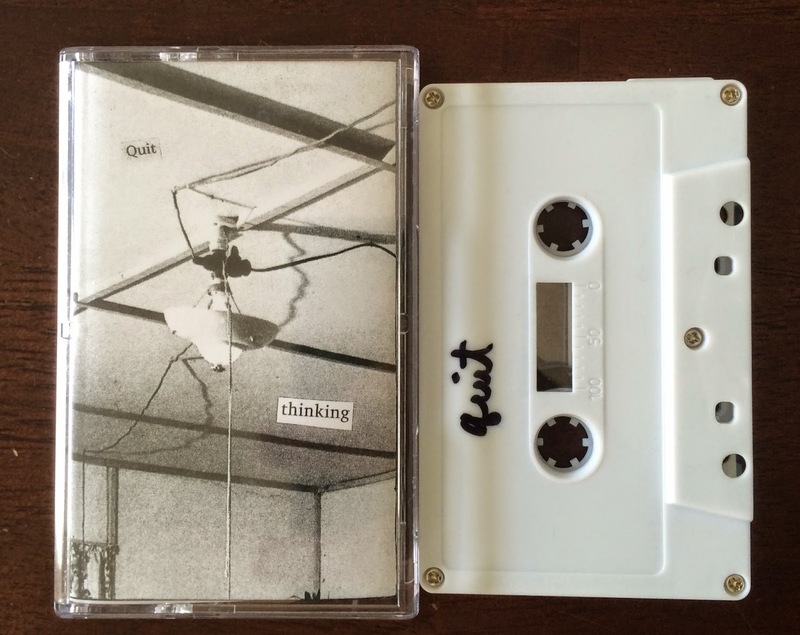 If so, this tape is for you – it’s a noisy reminder of a fun night at the pub. Don’t know this band from me? Well – hang on, I want to wait until Blondie, K, Jim, and their pals are out of the room. I’ll tell you about it in a sec. They’ve had their fun, so let’s leave them in their blissful ignorance. Are they gone now? Great – don’t bother with this hunk of unlistenable garbage. I feel bad for saying that, because I hate slagging on people, but a musical artifact for the masses this ain’t.